Good news for people who like French fries and cheese: It’s Poutine Week at New York’s famous Mile End Deli. 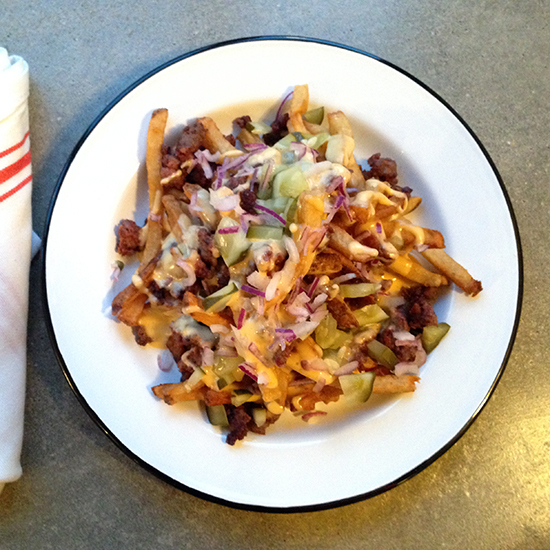 After the success of last year's smoked meat burger poutine (topped with a chopped patty of the deli's famous Montreal-style smoked meat), the shop's team hunkered down to invent four other mind-expanding, artery-constricting poutine variations. They even enlisted the help of The Fat Jewish, noted Instagrammer and lover of all things deli, to help design a version covered in more meat than you could ever possibly imagine. And today, Mile End has unleashed its poutines on the world. Get yours until Feb. 8 at Mile End Bond, Mile End Hoyt or their new pop-up at Threes Brewing in Brooklyn. They aren’t giving out prizes to people who eat through the whole menu, but just know that if you manage to do it, you’ll get serious respect from us. Now get out there and start poutining. And if you aren’t fortunate enough to live in New York City, you can still get Mile End smoked meats delivered anywhere in the country, and as of last week, you can get bagels from their sister spot, Black Seed Bagels, via FoodyDirect.